Me walking on the beach with Sophie, who took a few minutes to decide she could walk on the sand but then once she’d made up her mind it was ok took off down the strand until she fell in the mud. Can you see the fog bank rolling in on the horizon? Our usual Saturday morning outing to the farmer’s market in Hingham. Still too early for much produce: strawberries, raspberries (oh so perfectly sweet balanced with tart! ), romaine, tomatoes, collards, zucchini, peas. Also muffins and a scone and cookies. And the best iced tea I’ve ever had: a tall glass of sweetened Southern tea with orange blossom and mint! A short walk on the beach with the girls. The perfect sea breeze that made me want to linger all day. Followed by a picnic snack by the water: rosemary crostini with smoked salmon pate. Perfect. Then home to the chore list. So much to do in the final countdown. Oh I am so seriously nesting!!! On the shelf from left to right: an Madonna and child icon Dom had when we were married, a holy card with relic of Blessed Teresa of Calcutta that Dom received from some Missionaries of Charity who visited our parish, a holy card of the Sacred Heart that I picked up from a table at the Boston Catholic Women’s Conference, a holy card with relic of Blessed Pier Giorgio Frassati, a beeswax crucifix my sister brought home from somewhere in Europe, a small candle holder with a picture of Mary that one of Dom’s coworker’s gave us as a housewarming gift, Immaculate Heart of Mary candle, holy card with relic of Saint Faustina (the card actually says Blessed Faustina, so it must have been printed before her canonization), a triptych of the Madonna and child flanked by angels that Dom had when we were married (an image I love, especially because it’s one where she has a book). 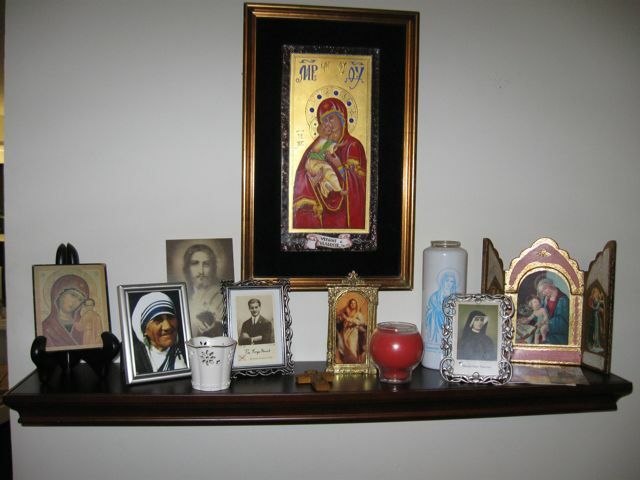 Above the shelf is a gorgeous icon of the Virgin of Vladimir that my parents bought in Murano, Italy hand painted on Venetian glass. This afternoon I also made some playdough for Bella using this recipe from the Bookworm. Sort of. We didn’t have cream of tartar so I think the texture might be a bit off. And I had to add considerably more flour because it refused to come together into a dough. Poor Bella had her heart set on purple and we had no food coloring. Though it didn’t exactly break my heart. I couldn’t stop her from eating the dough. Dom and the girls had lobster (also from the farmer’s market) for dinner. I wasn’t in the mood so had a leftover hamburger. While the girls’ bath was filling after dinner I managed to rearrange the furniture in their bedroom, swapping Sophie’s crib and the bookshelf. I hope that will discourage Bella from perching on the foot of her bed. Unfortunately I don’t think it will stop her from sitting on top of the bookshelf. There were many more things I wanted to do today; but I think I was overly ambitious. I’m satisfied that we made some good progress on my to do list. Thanks so much! I grow weary of listening to the “Sound of Music” soundtrack endlessly. And the more Protestant “Baby Praise” CD’s are too midi-music for me. I’ve been looking for something just like this. I am most decidedly not a musician and I can’t read music. The songs I can sing, I’ve learned either by singing them along with people (like at Mass) or hearing them on a cd. I’d love to teach the girls more chant but most of the recordings I’ve been able to find while beautiful are too complex for me to attempt to sing. Do you have any suggestions for good recordings that are easy to sing along with? Ah! I had not connected Isabella to this blog—I have been here before! Reading “music” is much harder than reading chant notation. If you can sing Do, A Deer and then the scale with solfege syllables (and the handsigns, which help greatly even though we adults have to get over our feeling silly about using them), you can learn to read and sight-sing chant. Then modern notation is a whack on the side of the head from there. While your girls are young is the time to start—they will catch on much faster than the adults, always! Patricia, Thank you so much for the links. This is exactly what I was looking for and did not know how to find. I’m listening to a beautiful Te Deum now and I’m in love. I’m adding some of these to my YouTube favorites list and you can be sure I’ll be playing them for the girls in the morning. Bella and I are going to be chanting the Ave Maria in no time now. I’m not so sure about my ability to sing even Do, A Deer and the scale with solfege syllables. Really until I had Bella I could never sing on key or carry a tune at all. At all. I think God has blessed me since her birth, giving me enough ability to be able to sing to her. My mom (who sings in her parish’s very excellent choir) even remarked on it when she was here last, how much improved I am at singing. However, we’ll forge on with videos and recordings and do our best. Perhaps even if I don’t get it I can teach the girls or get someone else to teach them. We do love music, though. Just tonight Bella opened up her songbook and sang for me: Amazing Grace and Bringing in the Sheaves and several others. My little songbird brings me great joy even if she is still super off, she’ll get it eventually I know. Most kids’ songs are lame, unless they’re nursery rhymes and the like. (So it’s not just you.) You’re much better off with short folk songs (the clean ones, of course!) and nursery rhymes. The Clancy Brothers put out a family album (their families) back in the Seventies, which is full of all kinds of good stuff that normal Irish kids really sang…. Ah! It’s bigger reissued, it’s called _So Early in the Morning_ and it’s listed as by The Clancy Children. It’s about 8-9 bucks, and features Clancy moms and dads and grandparents singing as well as the kids. Recommended! Interesting. I’ll have to check it out. I’ve been a huge fan of the Clancy Bros since college and Bella loves a You Tube video we found of their All God’s Creatures Have a Place in the Choir. I found out the original issue of the album came out in 1962. My dad had it as part of a later set of multiple Clancy albums…. But anyway, it doesn’t matter in terms of the much more recent CD reissue. I found a nice compilation album called Folk Songs for Kids, which includes folks like Jean Ritchie, Lightnin’ Hopkins and Odetta singing songs that kids often know. A lot of the songs are from the Clancy Children thing, though, so it might be something to pick out mp3 tracks from, if you buy the other.